The switch in genres doesn't mean story and consequences are being flung out. The next Divinity game, though it features a lot of returning Original Sin 2 characters, isn't a freewheeling, sandboxy RPG. Divinity: Fallen Heroes is a tactics game, but it retains a lot of RPG sensibilities, including being driven by a story with plenty of choices and consequences. It's going to be just as important here as it was in Original Sin 2. "In our game, story will define everything that happens in the missions, and everything that happens in the missions will define the story," Larian's Swen Vincke tells us. "And from this, Fallen Heroes was born." Fallen Heroes is set after Original Sin 2, with Lucian the Divine making a surprise return and commanding players to arrest Malady, who you'll probably remember from the last game, but who is now playable. "She has stolen powerful doomsday weapons from the Divine Order, and they're afraid she'll use the in a fit of anger," says Vincke. "But things are not what they seem." If you don't know anything about the Original Sin series or Divinity and just want to play a new tactics game, you shouldn't end up lost. While returning players might get something more out of it, the story itself is a standalone adventure. "People who haven't played Divinity will be able to enjoy it," says Vincke. 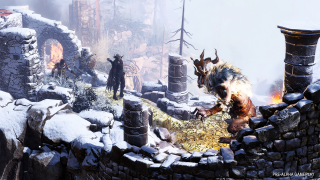 "But we really wanted to continue with the characters we'd developed in Original Sin 2. We like them, fans like them. Fans will love that you can now control Malady in battle. If you played Original Sin 2 it'll feel like coming home. But if you haven't, you'll meet a bunch of interesting characters." You'll be able to find out a lot more about Divinity: Fallen Heroes in our full interview with Vincke, available next week in the PC Gamer magazine.